A British team is developing a car that will be capable of reaching 1,000mph (1,610km/h). 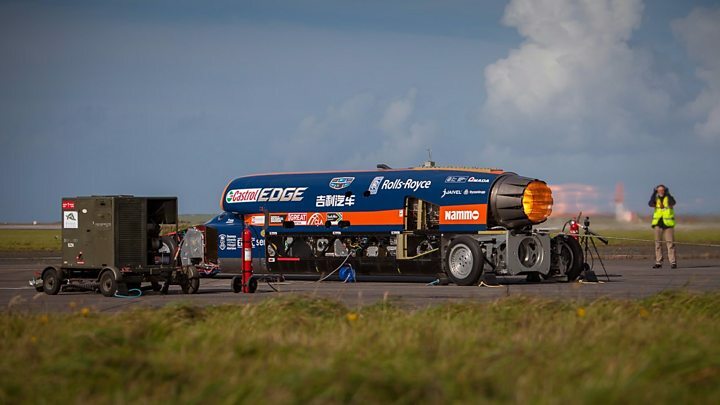 Powered by a rocket bolted to a Eurofighter-Typhoon jet engine, the vehicle will first mount an assault on the world land speed record (763mph; 1,228km/h). Bloodhound should start running on Hakskeen Pan in Northern Cape, South Africa, in 2019. Bloodhound roared into life right on cue. Several months ago, we committed to getting the car to Newquay Airport at the end of September, to start our "slow speed" (200 mph) UK runway tests. Exactly as planned, at 17:20 local on 28 September, the car's EJ200 jet engine fired up for the first time. Starting the jet engine on schedule is not the half of it, though. Here's the huge surprise. We got FULL REHEAT! You can see a clip of the car's massive power at the top of this page. Reaching full power was completely unexpected, even by the Rolls-Royce team who came down to support our engine tests. The static tie-down engine tests were designed to "characterise" the jet intake. The intake is sized to provide the jet engine with just the right amount of air - at 850 mph. When the car is stationary, or travelling very slowly (anything less than 100mph is "very slow"), there is no "ram effect" from the airflow, and the intake is too small to feed the jet engine with as much air as it would like. As a result, we were pretty certain that the jet would be power-limited, probably quite severely, at slow speeds. "Characterising" the intake was all about finding out just how much the engine would be limited. When I pushed the throttle pedal down to its first detent, trying to select "max dry" power (full engine rpm), we were all expecting the engine to struggle and stop short. I couldn't quite believe my eyes when the cockpit instruments showed full dry power. Hardly daring to hope, I pushed the throttle through the detent to select minimum reheat… and sure enough, it lit with no problem at all. Maximum reheat? Yes, that worked too. After shutting the car down, I climbed out to discuss the results with the rest of the team. We've spent years discussing the effects of the expected power limits. How would it affect our runway testing? What speed can we reach in the UK? How will it affect acceleration during record runs in South Africa? We were so concerned about the possible limitations that we even designed the air intake with the option to fit "auxiliary intakes" if necessary. If you look closely at the sides of the car, just behind the intake mouth, you'll see two large square hatches, where we can fit additional intake doors if required. These are now redundant, which is great news. One thing I can't describe to you is what full reheat sounded like outside the car, because I don't know. In the cockpit, I can see the engine instruments showing the power setting, and I can feel the car straining against its 10-tonne-rated steel tie-down cables, but I can't feel or hear the reheat at all. Outside the car it's a different matter. After the reheat runs, I asked Mark Elvin what it was like for the rest of the team. Mark is our senior mechanical designer, with a background in both F1 and aerospace, so he's worked with some pretty impressive technology in the past. Even he was struggling to find words for the shattering power of the EJ200. After collecting his thoughts for a moment, he said: "It was just astonishing. Simply astonishing." Now that we've completed the static testing, we need to do some dynamic testing of the car - wheels, brakes, steering, etc - as we prepare for our first big public runs on 26th and 28 October (there are still a few tickets left if you want to come and join us!). With this much power available, I have to confess to being both excited about the amazing performance on offer and a little nervous about controlling it. This car is going to be seriously fast and I've got to learn to drive it in a small handful of tests, before our first big (and public) runs. While we're getting the team and the car ready for our big show at the end of October, interest is growing everywhere. A couple of weeks ago I was in the Isle of Man, for a Bloodhound day with the local schools, organised by Swagelok. While the company is a huge multinational, the Isle of Man factory is very proud of its contribution to Bloodhound, as this is where some of the key components of our rocket system were designed and built. As you can imagine, the island's school kids were hugely excited to hear all about the world's fastest car. The Isle of Man post office has joined in the excitement, producing a commemorative set of Bloodhound stamps (joining other countries around the world who have celebrated the Land Speed Record with a set of stamps - did you know that Guinea-Bissau in West Africa has also produced some? No, me neither). One of the Isle of Man stamps is just a plain black silhouette of the Car, which looks a little boring until you rub it - after a few seconds, the thermochromic ink warms up and changes colour, revealing a cutaway diagram of the car. I've never seen a stamp with technology built into it - buy one and try it! It's not just youngsters in the Isle of Man that are getting excited. I was amazed to find out this month that a school in rural Zambia has been studying Bloodhound and making their own rocket cars. Our "Engineering Adventure" really is becoming a global event. Bloodhound's long-term aim is to create an "adventure" that will inspire a generation. It's a fact of life that we will only be able to measure our success after we've finished, but it's looking good so far. It's been a great few weeks getting Bloodhound ready to run. Keep watching the Bloodhound website, it won't be long before we're streaming live video and data from the most sophisticated Land Speed Record car ever made.